Just shy of two weeks after the Philippines reported their first HPAI outbreak, the results have come back from the reference lab in Australia, and the subtype has been identified as H5N6. This is the same subtype that - after circulating exclusively in China, Vietnam & Laos for two years - finally broke out last November causing major outbreaks in South Korea and (to a far lesser extent) in Japan, and eventually reaching Taiwan. While we've seen 17 reported human infections over the past 3 years - all out of China - the last confirmed case was in November of 2016 (see WHO Update On 2 Recent H5N6 Cases In China). The genotypes reported in South Korea and Japan have differed slightly from those found in China, which may help explain this lack of human infections outside of China (see J. Virology: Molecular Evolution and Emergence of Avian H5N6). Agriculture Secretary Emmanuel F. Piñol said today/August 24 the culling of all fowls in the avian flu-affected areas of San Luis in Pampanga and Jaen and San Isidro in Nueva Ecija had been completed. Piñol said the operation ensures the full containment of the spread of the dreaded avian influenza to the rest of the country, saying he felt relieved the strict quarantine measures were put in place as soon as the Department of Agriculture confirmed it. “Now that we know that the virus was confined to that area, I feel relieved,” Secretary Piñol said. Dr. Arlene Vytiaco, the focal person for avian influenza of the Bureau of Animal Industry (BAI), said the Australian Animal Health Laboratory has confirmed through genetic sequencing tests that the avian flu strain that hit San Luis, Pampanga was the highly-pathogenic H5N6, which is transmissible to humans. Vytiaco, however, said that there is very low rate of possibility of the virus being transmitted to humans. She pointed out that none of the workers in the affected poultry farms in the Pampanga and Nueva Ecija showed signs of the flu virus. She added that the DA is now focusing its investigation on where the avian flu virus that hit San Luis in Pampanga and Jaen and San Isidro in Nueva Ecija originated. Piñol, meanwhile, said a total of 476, 640 fowls were culled in San Luis, Pampanga, which included 331,150 layer chickens, 33,930 broilers, 32,850 ducks, 72, 190 quails, 158 pigeons, and 197 gamefowls. A total of 114,850 quails were culled in the town of Jaen while a total of 70,100 layer chickens were culled in San Isidro town, both in Nueva Ecija, the DA Secretary said. With the completion of the culling of all fowls in the affected towns, Piñol said he is now considering an amendment of an earlier memorandum circular that prohibited the shipment of balut eggs from outside the seven-kilometer quarantine radius to other parts of the Philippines. The DA will ensure that all the duck farms where the balut eggs come from would be subjected to strict inspection by government veterinarians, Piñol said. It may be a while in coming, but it will be of considerable interest to see a full genomic analysis of this Philippines H5N6 virus, to see how much it differs from those previously reported in China, Japan, and South Korea. Like its close cousin H5N8, H5N6 appears well adapted for carriage and spread by migratory birds. 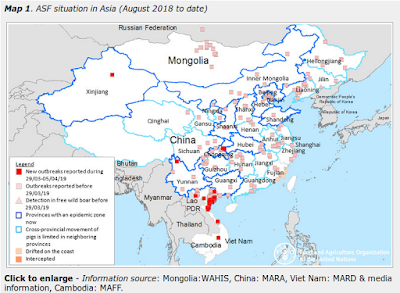 Which means that those countries that lie under the Asian Migratory Flyways (see below) are at risk of being visited by HPAI H5 - or possibly the seeing first appearance of H7N9 outside of China - later this fall when this year's southbound migratory season begins. For more, you may wish to revisit Sci Repts. : Southward Autumn Migration Of Waterfowl Facilitates Transmission Of HPAI H5N1.